Professional Home Inspection Institute's courses are approved by state boards, national home inspector societies, insurance companies, and other industry related organizations. Check each course for more details about specific approvals and special offers. Click the link above for more information about Professional Home Inspection Institute's training course approvals and accreditations. 1533 1/2 NW 2nd St.
PHII is an approved training provider for many State Workforce Investment Act (WIA) programs including our corporate home state of South Dakota. If you are eligible for WIA training, contact PHII for more information. PHII is an affiliate of the American Society of Home Inspectors (ASHI member #243641) and has designed training that meets or exceeds ASHI's high standards of practice. PHII is an affiliate of the National Association of Home Inspectors (NAHI). PHII graduates also qualify for a discount on NAHI start-up membership fees. Affiliate of the National Association of Mold Remediators and Inspectors (NAMRI). NAMRI is the mold division of the National Society of Home Inspectors. PHII's coursework is approved for CEC credits for IICRC, Institute of Inspection, Cleaning, & Restoration. PHII's coursework is approved and highly recommended by the Allen Insurance Group for home inspector errors and omissions insurance. E & O insurance requires training by an approved provider in order to qualify for coverage. PHII's coursework is approved by the Foundation of Real Estate Appraisers (FREA) for home inspector errors and omissions insurance. E&O insurance is required in somd states and requires training by an approved provider in order to qualify for coverage. PHII's coursework is approved by the Organization of Real Estate Professionals (OREP) for home inspector errors and omissions insurance coverage. PHII is approved for classroom training by the U.S. Department of Veterans Affairs which can qualify servicemembers and veterans of the U.S. armed forces to receive tuition assistance. PHII is an affiliate of FABI, which is an Orlando-based home inspector society that is Florida's primary state-based home inspector society (member AF-0038). The California Real Estate Inspection Association is the symbol of real estate inspection professionalism in the State of California. PHII is an affiliate of CREIA and offer a course that is aligned with CREIA's Standards of Practice. Professional Home Inspection Institute utilizes energy efficient ("green") servers. These servers use less electricity than conventional laptops! According to a study conducted by Stanford University, energy used by server hardware, switches, routers, and supporting equipment doubled in the US and worldwide between 2000 and 2005. PHII is approved to provide continuing education in Oregon. Advanced Home Inspection covers relevant subject matter for home inspectors and, as such is accepted by the Oregon CCB for CEU credit. PHII grants 32 CEU credits for the Advanced Home Inspection course. In Oregon, 30 CEUs are required in the 24 months prior to your certification expiration date. Our application for renewal has been approved. The KY approved course package includes Manufactured Homes and Environmental Hazards courses as well as a live training lab, all of which are offered free to PHII students. Maryland requires home inspectors to attend classroom training. The PHII classroom training program offered at our facility in Madison,SD has been approved for the 72 Hour pre-license training requirement. PHII's certification course is approved for all pre-license education requirements in Indiana. The law requires that inspectors complete a pre-licensing course of at least sixty (60) hours provided by a Board-approved course provider. The PHII Basic Home Inspection Course (classroom) has been approved for 48 hours of home inspection pre-licensing education by the South Dakota Real Estate Commission. The PHII Basic Home Inspection Course has been approved for pre-license training in New Hampshire. In New Hampshire home inspectors are required to complete 80 hours of board approved training. The PHII course has been approved for NH Board and fulfills this requirement. Home Inspectors in West Virginia are required to complete 80 hours of classroom training. The PHII Classroom Certification Course has been approved in West Virginia and meets this requirement. PHII's Basic Home Inspection Certification course is approved for pre-license education in Connecticut. Upon completion of the course, potential licensees need to file an intern application with the state and complete 100 inspections supervised by a licensed Connecticut Home Inspector. PHII's Basic Home Inspection Course has been approved for pre-license training in Mississippi. MS requires new home inspectors to complete 60 hours of approved home inspection training. PHII's Basic Home Inspection Course has been approved for the maximum of 20 points of education required to become licensed as a home inspector. PHII's Basic Home Inspection Course has been approved by the SC Residential Builders Commission for SC Home Inspectors. The law requires that home inspectors submit a Home Inspector License Application and include proof of training with the application. The PHII Basic Home Inspection Course (online) has been approved for 90 hours of home inspection pre-licensing education by the LA State Board of Home Inspectors. 14 hours board-approved continuing education is required each biennium prior to the renewal period. PHII is approved to provide continuing education in Oregon. Manufactured Home Inspection covers relevant subject matter for home inspectors and, as such is accepted by the Oregon CCB for CEU credit. PHII grants 16 CEU credits for the manufactured homes course. In Oregon, 30 CEUs are required in the 24 months prior to your certification expiration date. The Manufactured Home Inspection course has been approved for 16 professional development hours. Home inspectors are required to complete a minimum of 40 hours of continuing education for each biennial licensing period. Up to 20 units of continuing education can be obtain through online courses. Licensed home inspectors in Kansas are required to obtain 16 hours of continuing education annually. Professional Home Inspection Institute's Manufactured Home Inspection Course provides 16 continuing education hours in Kansas. Professional Home Inspection Institute's Manufactured Home Inspection Course provides 16 hours of continuing education for home inspectors in Wisconsin. In the state of Wisconsin, registered home inspectors are required to complete 20 hours each year of continuing education course related to home inspection. The New Hampshire Board of Home Inspectors requires continuing education as a condition of license renewal. Licensees must accumulate 20 continuing education hours for each licensing period. Manufactured Home Inspection provides 16 continuing education hours for home inspectors in New Hampshire. Home Inspectors in West Virginia can use the Manufactured Home Inspection Course to fulfill all 16 hours of their continuing education requirement. An applicant for renewal of a home inspector certification must complete at least 16 hours of acceptable continuing education. The PHII Manufactured Home Inspection Course has been approved for 12 hours of continuing education in Illinois. Prior to renewing a license, the licensee is required to complete 12 hours of continuing education during the two year license period. New inspectors receiving their initial license during that period are only required to complete 6 CE hours. Virginia does not require a license for Residential Pest Inspectino at this time. PHII is approved to provide continuing education in Oregon. Structural Pest Inspection covers relevant subject matter for home inspectors and, as such is accepted by the Oregon CCB for CEU credit. PHII grants 24 CEU credits for the pest inspection course. In Oregon, 30 CEUs are required in the 24 months prior to your certification expiration date. Pennsylvania does not license Pest Inspectors, however many banks require inspectors to have their Pest Applicator's license before they will contract with them. To maintain pesticide certification, applicators must accumulate update training at three-year intervals for which recertification credits have been approved. Regardless of the category of certification, each applicator must accumulate six core credits. The number of category-specific credits required for recertification varies from category to category. 11 - Household / Health Related - 10 credits. 12 - Wood Destroying Pests - 10 credits. 18 - Demonstration and Research - 10 credits. 19 - Wood Preservation - 4 credits. 23 - Park/School Pest Control - 10 credits. The Structural Pest Inspection course has been approved for 24 continuing education units. Home inspectors are required to complete a minimum of 40 units of continuing education for each biennial licensing period. Up to 20 units of continuing education can be obtain from online courses. Professional Home Inspection Institute's Structural Pest Inspection Course provides 24 hours of continuing education for home inspectors in Wisconsin. In the state of Wisconsin, registered home inspectors are required to complete 20 hours each year of continuing education course related to home inspection. The New Hampshire Board of Home Inspectors requires continuing education as a condition of license renewal. Licensees must accumulate 20 continuing education hours for each licensing period. Structural Pest Inspection provides 24 continuing education hours for home inspectors in New Hampshire. PHII is approved to provide continuing education in Oregon. Residential Mold Inspector Certification covers relevant subject matter for home inspectors and, as such is accepted by the Oregon CCB for CEU credit. In Oregon, 30 CEUs are required in the 24 months prior to your certification expiration date. Licensed home inspectors in Kansas are required to obtain 16 hours of continuing education annually. Professional Home Inspection Institute's Residential Mold Inspector Certification Course provides 16 continuing education hours in Kansas. Professional Home Inspection Institute's Residential Mold Inspector Certification Course provides 16 hours of continuing education for home inspectors in Wisconsin. In the state of Wisconsin, registered home inspectors are required to complete 20 hours each year of continuing education course related to home inspection. The New Hampshire Board of Home Inspectors requires continuing education as a condition of license renewal. Licensees must accumulate 20 continuing education hours for each licensing period. Residential Mold Inspector Certification provides 32 continuing education hours for home inspectors in New Hampshire. Home Inspectors in West Virginia can use the Residential Mold Inspector Certification Course to fulfill all 16 hours of their continuing education requirement. An applicant for renewal of a home inspector certification must complete at least 16 hours of acceptable continuing education. We must submit the name and registrant number of the individual/s who complete the program, using the form they provided. The course code is 1856. Continuing Education Requirement: 14 hours board-approved continuing education is required each biennium prior to the renewal period. PMII's Residential Mold Inspector Certification is approved for 90 Credit Hours. The PMII Mold Remediation course has been approved by the state of LA for the required 24 hours of board approved course work in mold remediation and basic mold assessment. Students must also apply for a license through the state and take 4 hours of instruction in Louisiana's Unfair Trade Practices and Consumer Protection Law. This can be done through the state after license is approved. Licensed home inspectors in Kansas are required to obtain 16 hours of continuing education annually. Professional Home Inspection Institute's Mold Remediation Certification Course provides 16 continuing education hours in Kansas. Professional Home Inspection Institute's Mold Remediation Certification Course provides 16 hours of continuing education for home inspectors in Wisconsin. In the state of Wisconsin, registered home inspectors are required to complete 20 hours each year of continuing education course related to home inspection. The New Hampshire Board of Home Inspectors requires continuing education as a condition of license renewal. Licensees must accumulate 20 continuing education hours for each licensing period. Mold Remediation provides 24 continuing education hours for home inspectors in New Hampshire. Home Inspectors in West Virginia can use the Mold Remediation Certification Course to fulfill all 16 hours of their continuing education requirement. An applicant for renewal of a home inspector certification must complete at least 16 hours of acceptable continuing education. e must submit the name and registrant number of the individual/s who complete the program, using the form they provided. The course code is 1855. Continuing Education Requirement: 14 hours board-approved continuing education is required each biennium prior to the renewal period. PMII's Mold Remediation Certification is approved for 40 Credit Hours. Licensed home inspectors in Kansas are required to obtain 16 hours of continuing education annually. Professional Home Inspection Institute's Commercial Mold Inspector Certification provides 16 continuing education hours in Kansas. Professional Home Inspection Institute's Commercial Mold Inspector Certification Course provides 16 hours of continuing education for home inspectors in Wisconsin. In the state of Wisconsin, registered home inspectors are required to complete 20 hours each year of continuing education course related to home inspection. The New Hampshire Board of Home Inspectors requires continuing education as a condition of license renewal. Licensees must accumulate 20 continuing education hours for each licensing period. Commercial Mold Inspector provides 16 continuing education hours for home inspectors in New Hampshire. Home Inspectors in West Virginia can use the Commercial Mold Inspector Certification Course to fulfill all 16 hours of their continuing education requirement. An applicant for renewal of a home inspector certification must complete at least 16 hours of acceptable continuing education. Continuing Education Requirement: 14 hours board-approved continuing education is required each biennium prior to the renewal period. PMII's Commercial Mold Inspection is approved for 16 Credit Hours. Hours must appear on the certificate to be approved by the state. Licensed home inspectors in Kansas are required to obtain 16 hours of continuing education annually. Professional Home Inspection Institute's Advanced Home Inspection Course - Module 1 provides 8 continuing education hours in Kansas. Professional Home Inspection Institute's Advanced Home Inspection Course - Module 1 provides 8 hours of continuing education for home inspectors in Wisconsin. In the state of Wisconsin, registered home inspectors are required to complete 20 hours each year of continuing education course related to home inspection. The New Hampshire Board of Home Inspectors requires continuing education as a condition of license renewal. Licensees must accumulate 20 continuing education hours for each licensing period. Module 1: Structure, Exterior & Roofing provides 8 continuing education hours for home inspectors in New Hampshire. Home Inspectors in West Virginia can use Advanced Home Inspection, Module 1: Structure, Exterior & Roofing to fulfill 8 hours of their continuing education requirement. An applicant for renewal of a home inspector certification must complete at least 16 hours of acceptable continuing education. Licensed home inspectors in Kansas are required to obtain 16 hours of continuing education annually. Professional Home Inspection Institute's Advanced Home Inspection Course - Module 2 provides 8 continuing education hours in Kansas. Professional Home Inspection Institute's Advanced Home Inspection Course - Module 2 provides 8 hours of continuing education for home inspectors in Wisconsin. In the state of Wisconsin, registered home inspectors are required to complete 20 hours each year of continuing education course related to home inspection. The New Hampshire Board of Home Inspectors requires continuing education as a condition of license renewal. Licensees must accumulate 20 continuing education hours for each licensing period. Module 2: Plumbing & Electrical Systems provides 8 continuing education hours for home inspectors in New Hampshire. Home Inspectors in West Virginia can use Advanced Home Inspection, Module 2: Plumbing & Electrical Systems to fulfill 8 hours of their continuing education requirement. An applicant for renewal of a home inspector certification must complete at least 16 hours of acceptable continuing education. Licensed home inspectors in Kansas are required to obtain 16 hours of continuing education annually. Professional Home Inspection Institute's Advanced Home Inspection Course - Module 3 provides 8 continuing education hours in Kansas. Professional Home Inspection Institute's Advanced Home Inspection Course - Module 3 provides 8 hours of continuing education for home inspectors in Wisconsin. In the state of Wisconsin, registered home inspectors are required to complete 20 hours each year of continuing education course related to home inspection. The New Hampshire Board of Home Inspectors requires continuing education as a condition of license renewal. Licensees must accumulate 20 continuing education hours for each licensing period. Module 3: Heating & Air-Conditioning provides 8 continuing education hours for home inspectors in New Hampshire. Home Inspectors in West Virginia can use Advanced Home Inspection, Module 3: Heating & Air-Conditioning Systems to fulfill 8 hours of their continuing education requirement. An applicant for renewal of a home inspector certification must complete at least 16 hours of acceptable continuing education. Professional Home Inspection Institute's Advanced Home Inspection Course - Module 4 provides 8 hours of continuing education for home inspectors in Wisconsin. In the state of Wisconsin, registered home inspectors are required to complete 20 hours each year of continuing education course related to home inspection. The New Hampshire Board of Home Inspectors requires continuing education as a condition of license renewal. Licensees must accumulate 20 continuing education hours for each licensing period. Module 4: Interiors, Ethics & Report Writing provides 8 continuing education hours for home inspectors in New Hampshire. Home Inspectors in West Virginia can use Advanced Home Inspection, Module 4: Interiors, Ethics & Report Writing to fulfill 8 hours of their continuing education requirement. An applicant for renewal of a home inspector certification must complete at least 16 hours of acceptable continuing education. PHII is approved to provide continuing education in Oregon. Thermal Inspection & Insulation Remediation covers relevant subject matter for home inspectors and, as such is accepted by the Oregon CCB for CEU credit. PHII grants 12 CEU credits for the thermal inspection course. In Oregon, 30 CEUs are required in the 24 months prior to your certification expiration date. The Thermal Inspection & Insulation Remediation course has been approved for 11 continuing education units. Home inspectors are required to complete a minimum of 40 units of continuing education for each biennial licensing period. Up to 10 units of continuing education can be obtain online. A home inspector taking this course will be able to carryover over the one additional units to the next licensing period as long as s/he has at least 30 other continuing education units and this course is completed within 6 months of the end of the licensing period. Licensed home inspectors in Kansas are required to obtain 16 hours of continuing education annually. Professional Home Inspection Institute's Thermal Inspection & Insulation Remediation provides 12 continuing education hours in Kansas. Professional Home Inspection Institute's Thermal Inspection & Insulation Remediation Course provides 12 hours of continuing education for home inspectors in Wisconsin. In the state of Wisconsin, registered home inspectors are required to complete 20 hours each year of continuing education course related to home inspection. Home Inspectors in West Virginia can use the Thermal Inspection & Insulation Remediation Course to fulfill 12 hours of their continuing education requirement. An applicant for renewal of a home inspector certification must complete at least 16 hours of acceptable continuing education. Licensed home inspectors in Kansas are required to obtain 16 hours of continuing education annually. Professional Home Inspection Institute's Environmental Hazards Course provides 8 continuing education hours in Kansas. Professional Home Inspection Institute's Environmental Hazards Course provides 8 hours of continuing education for home inspectors in Wisconsin. In the state of Wisconsin, registered home inspectors are required to complete 20 hours each year of continuing education course related to home inspection. The New Hampshire Board of Home Inspectors requires continuing education as a condition of license renewal. Licensees must accumulate 20 continuing education hours for each licensing period. Environmental Hazards provides 8 continuing education hours for home inspectors in New Hampshire. Home Inspectors in West Virginia can use the Environmental Hazards Course to fulfill 8 hours of their continuing education requirement. An applicant for renewal of a home inspector certification must complete at least 16 hours of acceptable continuing education. The Environmental Hazards Course has been approved for 8 continuing education units. Home inspectors are required to complete a minimum of 40 units of continuing education for each biennial licensing period. Up to 20 units of continuing education can be obtain through online courses. PHII is approved to provide continuing education in Oregon. The Environmental Hazards Course covers relevant subject matter for home inspectors and, as such is accepted by the Oregon CCB for CEU credit. PHII grants 24 CEU credits for the Environmental Hazards Course. In Oregon, 30 CEUs are required in the 24 months prior to your certification expiration date. Licensed home inspectors in Kansas are required to obtain 16 hours of continuing education annually. Professional Home Inspection Institute's Residential Appliance Efficiency provides 10 continuing education hours in Kansas. Professional Home Inspection Institute's Residential Appliance Efficiency Course provides 10 hours of continuing education for home inspectors in Wisconsin. In the state of Wisconsin, registered home inspectors are required to complete 20 hours each year of continuing education course related to home inspection. The New Hampshire Board of Home Inspectors requires continuing education as a condition of license renewal. Licensees must accumulate 20 continuing education hours for each licensing period. Residential Appliance Efficiency provides 10 continuing education hours for home inspectors in New Hampshire. Home Inspectors in West Virginia can use the Residential Appliance Efficiency Course to fulfill 10 hours of their continuing education requirement. An applicant for renewal of a home inspector certification must complete at least 16 hours of acceptable continuing education. Licensed home inspectors in Kansas are required to obtain 16 hours of continuing education annually. Professional Home Inspection Institute's Energy Audit Diagnostics Course provides 20 continuing education hours in Kansas. Professional Home Inspection Institute's Energy Audit Diagnostics Course provides 20 hours of continuing education for home inspectors in Wisconsin. In the state of Wisconsin, registered home inspectors are required to complete 20 hours each year of continuing education course related to home inspection. The New Hampshire Board of Home Inspectors requires continuing education as a condition of license renewal. Licensees must accumulate 20 continuing education hours for each licensing period. Energy Audit Diagnostics provides 20 continuing education hours for home inspectors in New Hampshire. Home Inspectors in West Virginia can use the Energy Audit Diagnostics Course to fulfill all 16 hours of their continuing education requirement. An applicant for renewal of a home inspector certification must complete at least 16 hours of acceptable continuing education. Nebraska requires a separate license for radon inspection. 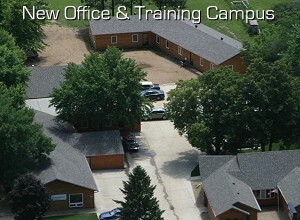 The PHII course meets the requirements for pre-licensing training in Nebraska. With a certificate of completion from our course, potential inspectors will be able to pursue their Radon Measurement License. PHII is approved to provide continuing education in Oregon. Radon Measurement Certification covers relevant subject matter for home inspectors and, as such is accepted by the Oregon CCB for CEU credit. PHII grants 16 CEU credits for the radon measurement course. In Oregon, 30 CEUs are required in the 24 months prior to your certification expiration date. 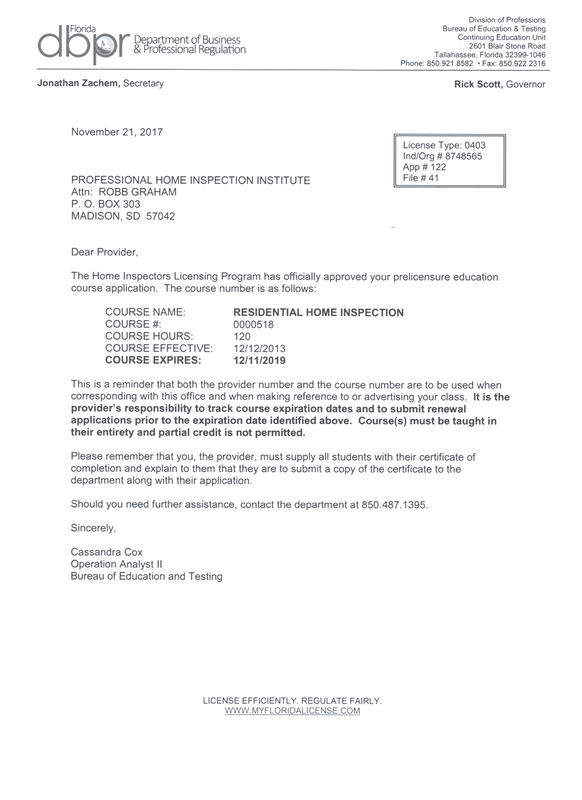 Licensed Home Inspectors in Connecticut are required to complete at least 20 continuing education hours in each two year period. The Radon Measurement Certification Course has been approved by the Dept. of Consumer Protection - Home Inspection Licensing Board for 16 continuing education hours. Professional Home Inspection Institute's Radon Measurement Certification Course provides 16 hours of continuing education for home inspectors in Wisconsin. In the state of Wisconsin, registered home inspectors are required to complete 20 hours each year of continuing education course related to home inspection. PHII's Radon Measurement Certification Course is approved to meet the continuing education requirements for radon professionals in Nebraska. Radon professionals are required to obtain 6 continuing education hours for each two year licensing cycle (10 CE hours are required for professionals licensed in both Radon Measurement and Radon Mitigation). The Radon Measurement Certification course has been approved by the Iowa Department of Public Health, Radon Program at 16 continuing education units (CEUs) for licensed radon measurement professionals in Iowa. The New Hampshire Board of Home Inspectors requires continuing education as a condition of license renewal. Licensees must accumulate 20 continuing education hours for each licensing period. Radon Measurement provides 16 continuing education hours for home inspectors in New Hampshire. Home Inspectors in West Virginia can use the Radon Measurement Certification Course to fulfill all 16 hours of their continuing education requirement. An applicant for renewal of a home inspector certification must complete at least 16 hours of acceptable continuing education. South Dakota does not require a separate license for radon inspection. Consumer are encouraged to select radon professionals who are certified by National Radon Safety Board (NRSB) and National Radon Proficiency Program (NRPP). Radon inspectors are not licensed in this state. However, the state does have a listing of Radon professionals certified through NRPP or NRSB. Our course, Radon Measurement Certification, is approved by both NRSB and NRPP to provide the required training. Once completing the course, you'll need to pass the certification exam for the organization you wish to join. Our course, Radon Measurement Certifcation, is approved by both NRSB and NRPP to provide the required training. Once completing the course, you'll need to pass the certification exam for the organization you wish to join. Professional Home Inspection Institute's Weatherization & Insulation Remediation Course provides 24 hours of continuing education for home inspectors in Wisconsin. In the state of Wisconsin, registered home inspectors are required to complete 20 hours each year of continuing education course related to home inspection. The New Hampshire Board of Home Inspectors requires continuing education as a condition of license renewal. Licensees must accumulate 20 continuing education hours for each licensing period. Weatherization & Insulation Remediation provides 24 continuing education hours for home inspectors in New Hampshire. Professional Home Inspection Institute's Manufactured Homes Weatherization Course provides 12 hours of continuing education for home inspectors in Wisconsin. In the state of Wisconsin, registered home inspectors are required to complete 20 hours each year of continuing education course related to home inspection. The New Hampshire Board of Home Inspectors requires continuing education as a condition of license renewal. Licensees must accumulate 20 continuing education hours for each licensing period. Manufactured Home Weatherization provides 12 continuing education hours for home inspectors in New Hampshire. Continuing Education Requirement: 14 hours board-approved continuing education is required each biennium prior to the renewal period. PMII's Mold Remediation Protocols is approved for 16 Credit Hours.